“Generic-ballot” polls predict a nine or ten point Democratic victory in House elections this fall, enough to flip the chamber. 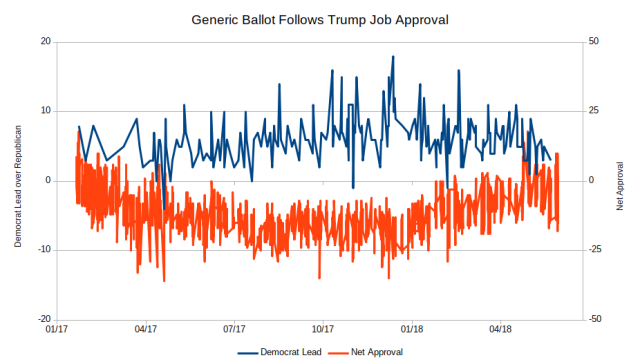 As most observers know, support for the Democrats on the so-called “generic-ballot” question has moved inversely to the public’s opinion about Donald Trump’s performance in office. Can we use this link between support for the parties on the generic-ballot question and Trump’s job approval figures to forecast possible election results in November? There are 228 generic-ballot polls in my current dataset covering the period from Inauguration Day, January 20, 2017, through June 9, 2018. Of those 228 polls, 209 also collected data on presidential approval. Those 209 polls constitute the sample for this analysis. 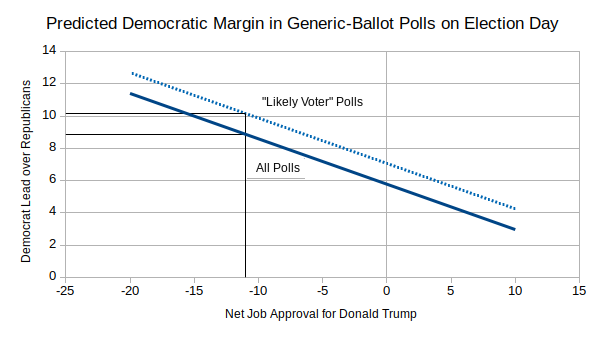 A weighted-least-squares model using my standard predictors — days in office, polling method, and polling sample — plus the net Trump job approval score “explains” about half the variance in the size of the Democrats’ lead on the generic-ballot question. Overall, the Democrats’ lead has increased at a slow, but discernible pace since the Inauguration. Even after taking Trump’s job approval into account, I find support for the Democrats grows about 0.3 percent every hundred days. At that pace, the Democrats will have picked up about 2.2 percentage points by the time the election takes place on November 6th, some 655 days after Trump took office. Two other factors influence the size of a poll’s Democratic lead. The Democrats do about 2.2 percent worse in online polls than in ones conducted by telephone. On the other hand, polls restricted to “likely” voters show a marginally significant (p < 0.11) boost for the Democrats of 1.3 percent. That might indicate a slight Democratic advantage in voter mobilization going into the fall, but the effect is still too small, and too variable, to be taken seriously at the moment. Models of the relationship between House votes won and House seats won find that, to take back the House, the Democrats will likely need to win by a margin of +7 or better to overcome gerrymandering and partisan geographic self-selection. For instance, The Economist’s simulation model for the House midterms predicts that the Democrats will win 54.3 percent in November, or a margin of 8.6 percent. In their model that gap translates into a Democratic seat margin of 224-211, enough to retake control of the House. History suggests that both the President’s approval rating and support for the President’s party in the House are lower on election day than they are in the spring.